The Great American Eclipse of 2017 has come and gone. For 93 minutes the shadow of the moon crossed America from Oregon to South Carolina. This spectacular natural phenomenon was within a day’s drive of 88 million people. I was one of the lucky 12 million people to live in the path of totality. The length of totality at home was a mere 85 seconds, so over the last 6 months I pondered where I might set up to experience a bit more totality. I finally decided on Mud Lake, a scenic lake in the upper Snake River Plain northwest of Idaho Falls. A week before the eclipse I moved my travel trailer to the north boat ramp on Mud Lake, where dispersed camping is permissible. Rarely is there more than a couple of campers at the location. I went back and forth over the week between home and camp. By Thursday others were beginning to arrive. On Saturday I settled in for the duration. By Sunday the camp looked like a village. Old friends joined me from Utah and many new friends were made. On Sunday evening some worrisome clouds came through. But the anticipation was exhilarating. I had planned a detailed sequence of shots from two cameras, one wide angle to capture the whole sequence from the start of the partial eclipse through totality and again for the second partial phase. I found one spot about a half a mile from camp where I could fit the entire scene in one frame with the lake at the bottom. The second camera was zoomed to 500 mm for tight exposures at totality, which would be for 2 minutes and 16 seconds. On Monday morning we awoke to find the clouds had passed and everything was looking great. More and more people showed up, parking along the edge of the normally lightly traveled dirt road by the lake. An action photographer from Southern California had arrived the day before and we set up along the lake’s edge a couple of hours before the show started. My Utah friends sat in their lounge chairs up the hill. Finally the moon began creeping between us and the sun. I began shooting the wide angle camera every 7 minutes. By the time the sun was a crescent shape the light had significantly dimmed and the temperature dropped, perhaps as much as 20 degrees. And then we were in the shadow – filters off the camera, solar glasses put aside, watching the most amazing sight I’ve ever seen. 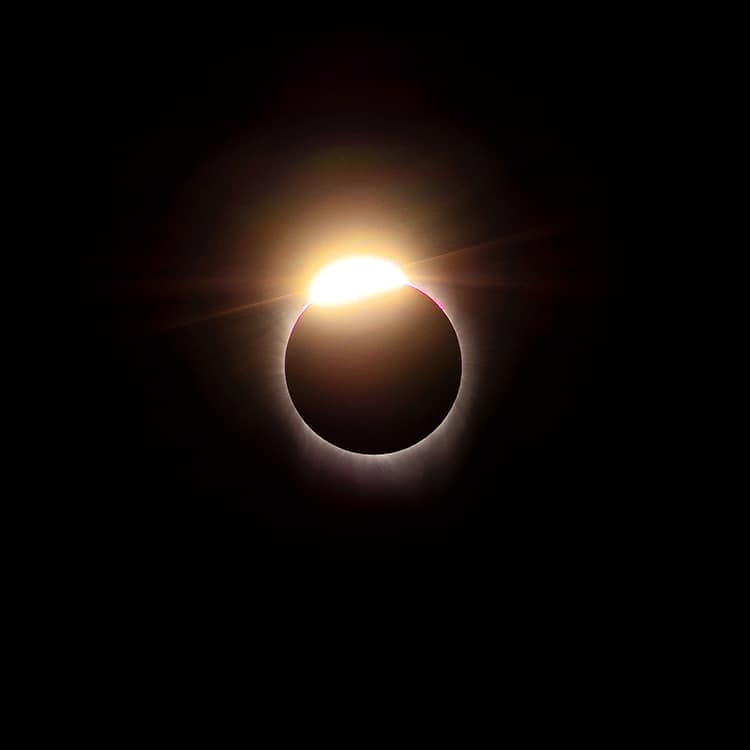 At the beginning and end of totality, the sun/moon looks light a giant diamond ring in the sky. Watching the corona dance around the moon, with a sunset that extends 360 degrees around the horizon is something I’ll never forget. After our 136 seconds in the shadow of the moon, the sun began to re-emerge. It was amazing. I continued shooting the concluding partial phase with shots every 7 minutes, knowing that great big shadow was crossing the country at up to 2400 mph. Alas at 12:57 I made my last image and returned to camp. Many were rushing to return home. 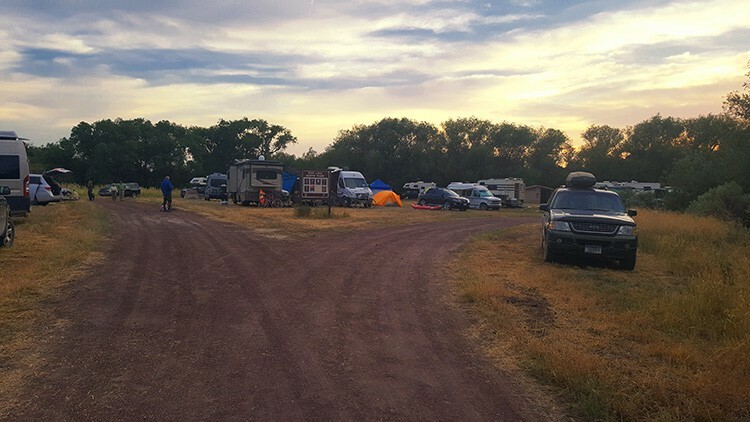 A group of us celebrated the day and stayed at camp, not wanting to get caught in the massive traffic jam that had been predicted. Everyone was already talking about doing it all over in 2024 when it happens again. Here’s the composite of the entire solar eclipse, from beginning to end over Mud Lake.